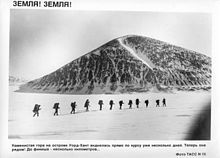 The Soviet–Canadian 1988 Polar Bridge Expedition (also known as Skitrek) began on March 3, 1988, when a group of thirteen Russian and Canadian skiers set out from Siberia, in an attempt to ski to Canada over the North Pole. The nine Russians and four Canadians reached the pole on 25 April and concluded their trek on Wednesday, June 1, 1988, when they reached Ward Hunt Island, Ellesmere, Northern Canada. At the North Pole, they were welcomed by a group of dignitaries from the Soviet Union and Canada, members of the international press, and radio amateurs involved in support and communications. The daily progress of the skiers was followed by many thousands of school children and radio amateurs around the world. They listened to the voice synthesizer on board the UoSAT-OSCAR-11 satellite, which transmitted the latest known position of the expedition in FM on the two-meter VHF amateur radio band, using digitised voice; and to progress reports, produced regularly by AMSAT-NA, which were distributed worldwide through amateur packet radio and orbiting amateur radio satellites. 6.1 message 1, March 9, after one week "on the ice"
In the autumn of 1986, a group of Soviet scientists and radio amateurs made plans to ski to the South Pole, starting at the Antarctic coast. They intended to use amateur shortwave radio for all their communication with the outside world, especially the support stations in Moscow. However, it is not a good idea to rely on radio propagation conditions to the other side of the world, even with a support station on the Antarctic continent itself; so, in November, 1986, the University of Surrey (UoS) UoSAT centre was contacted to investigate the feasibility of using the UoSAT-OSCAR-11 satellite to relay information to the skiers. Since UoSAT-2 (a.k.a. UO-11 or UoSAT-Oscar-11) is a sun-synchronous polar orbiting satellite in a low earth orbit, it passes over the poles every 98 minutes and a small handheld receiver with a simple whip aerial is sufficient to get a few minutes of excellent reception on each pass. By the end of 1987, while preparations were under way in the USSR, it was decided that the expedition would not take place at the South Pole, but instead at the North Pole; and the team would consist not only of Soviets, but a few experienced Canadian skiers as well. This time they would not only ski to the pole but continue their trek to Canada. 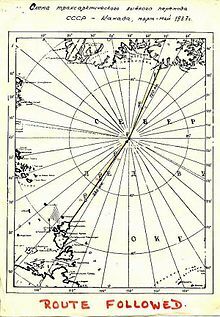 The objective thus became to ski across the Arctic Ocean from the Siberian coast, via the North Pole, to the Canadian coast. The expedition started on March 3, 1988, and finished on June 1, when the skiers reached the small Ward Hunt Island just off Cape Columbia at Ellesmere Island, Northern Canada. The expedition was privately organized by 'Komsomolskaya Pravda', (the Soviet Youth Newspaper). Sponsors were the Soviet Youth Travel Agency 'Sputnik', and McDonald's restaurants of Canada. Canadian Project Manager was the Polar Bridge Company, a group organized by the Canadian skiers. All the necessary equipment for the 1,750 kilometres (1,090 mi) route was carried in rucksacks. No sledges, dogs or other transport vehicles were used, other than six airdrops of new supplies, carried out by Russian and Canadian planes. The Canadian and Russian skiers trained in both Canada and Siberia during the months prior to the expedition and also tried to learn to speak and understand each other's language. The main obstacles during the 95–100 days were open water, pressure ridges, thin ice, blizzards and very low temperatures, (-50 °C). They were medically examined before and after the expedition. The Russian group consisted of: expedition leader and Arctic explorer Dmitry Shparo; photographer Alexander (Sasha) Belyayev, also in charge of meals; artist Fyodor Konyukhev; cameraman Vladimir Ledenev; physician Mikhail (Misha) Malakhov; radio operators Anatoli Melnikov and Vasili Shishkaryov; Anatoly Fedyakov who was responsible for equipment; and researcher Yuri Hmelevsky. The four Canadians were: navigator Richard Weber; radio operator Laurie Dexter; doctor Max Buxton; and scientist Chris Holloway. (See List of firsts in the Geographic North Pole). Communications were handled via HF (shortwave) amateur radio between the skiers and support stations on and near the Arctic Ocean, and headquarters in Moscow and Ottawa. Special amateur radio call signs, CI8UA and EXOVE, were allocated for the expedition; and prefixes, CI8 and EX, for the support stations. The University of Surrey's orbiting space satellite UoSAT-OSCAR-11 was used to relay the position of the group, using the on-board Digitalker, (a computer speech synthesizer). At this time, before the advent of GPS, the position of the group was obtained by celestial measurements made by skiers themselves, and by using a beacon or Emergency Locator Transmitter (ELT) to send signals to be picked up by one of the COSPAS and SARSAT 'Search and Rescue' satellites when it flies overhead. Like the UoSAT satellite, they are in Low Earth Orbit (LEO), flying over the poles every 95–98 minutes. The position is calculated by command and tracking stations in Moscow and Canada, using the on-board stored date and time of the signal, and the measured Doppler effect, (a shift in frequency due to the relative velocity between the beacon and the satellite). The skiers could not do the translation to degrees longitude and latitude, because this would require special receivers and computers. Once processed, the data was sent directly to the skiers via shortwave amateur radio, (radio propagation conditions permitting), and by telex or shortwave radio (digital packet radio or voice) to the UoSAT command station at the University of Surrey in Guildford, Surrey, UK. There the information was subsequently loaded into the UoSAT-OSCAR-11 Digitalker. To listen to the satellite, the skiers carried ICOM u2AT handhelds, which were donated by ICOM and tested at very low temperatures, (-50 °C). The shortwave radio equipment used by the expedition was a Soviet-made solid state 10 watt tranceiver. It weighed 1.2 kilograms without batteries and had six fixed, crystal controlled frequencies for single-sideband (SSB) operation on the 80, 40 and 20 meter amateur radio bands. The 2 kg lithium battery provided the 2.2 amps at 12 V required to operate the transceiver for about a month, one hour per day, at low temperatures. The antenna for the system was an inverted-V with the mast made of five skis fitted together. The limited lifetime of the batteries was one of the reasons that there was generally no contact between radio 'Hams' and the skiers, other than with the support stations. Uploads from the control station at the University of Surrey to the polar orbiting UoSAT satellite were delayed six to seven hours because the satellite only comes in range during two daily 'windows': two or three passes in the morning and two or three passes in the evening. The satellite flies over the North Pole every 98 minutes. Each day around 1100 GMT the skiers rested for about eight hours and switched on their ELTs for about two hours. During this period the COSPAS/SARSAT satellites passed at least once. When the satellites came in range of their ground stations in Moscow or Ottawa, the information was downloaded and processed. The resulting position in degrees longitude and latitude was then passed on to the Ski-Trek amateur radio support stations. One of the problems was composing, from a limited vocabulary, a proper DIGITALKER message for the expedition. The speech chips on board the satellite had about 500 words, some with an American accent, others with an English accent. The manufacturers actually used human voices which were digitised, not unlike the Compact Disc technique, but with fewer samples per second. Words such as NORTH, WEST, EAST, POSITION, LATITUDE, and LONGITUDE were not available, and new words could not be added. Fortunately, they did have DEGREE, TIME, and DATE. see here for an audio recording. The number would increase for every new position report, (typically once per day). The priority was an emergency code, for when all communication with the skiers failed. Assuming they could still listen to UoSAT, it gave the possibility to acknowledge the last received message and indicate the action taken, like sending a plane or helicopter, if necessary. This feature was not needed. '73' is amateur radio speak, (originating from Morse code), for 'Greetings and Good Bye'. This unprecedented hybrid link, involving ELTs, SARSAT/COSPAS, voice or telex and UoSAT-OSCAR-11 was known as NORDSKI COMM. It was the co-primary navigation tool for the skiers; celestial navigation was the other, more traditional, method. The start was delayed two days by bad weather preventing the airplane taking off for Sredniy. As the skiers set out, temperatures were around -47 °C with occasional blizzards. It was still polar night which would end at the start of spring, 23 May. Unexpectedly for those not familiar with Arctic regions, the skiers reported many leads of open water. They didn't use their single man boats, opting to try to go around the lead, or wait until the gap narrowed. The main cause of this open water phenomenon is the Transpolar Drift Stream, a major force in the ocean, which makes the ice break up and drift away, helped by the ever blowing wind. Even when the skiers rested for a few days, their position changed by several kilometres a day, usually in a northerly direction. The daily routine consisted of a steady 10- to 12-hour trek, followed by setting up their single twelve-man tent, switching on their ELT, having a meal of dried food, and spending a few minutes on the shortwave radio (80 m). A few hours later they again had a short contact on 80m to get the SARSAT/COSPAS information. When shortwave propagation failed, they had to wait until the UoSAT satellite was overhead and listen to the Digitalker. The morning routine included a quick breakfast and tent break-down. The skiers reported building igloos to dry clothing. Damp clothing froze as soon as they took it off. The main tent had the damp problem as well, but the temperature inside a properly built igloo can rise above 0 °C. The first of 6 airdrops of supplies took place on March 14. Eleven parachute assisted drops were made in two passes over the skiers with an Antonov AN-74 Soviet plane, specially designed for this type of expedition work. Later, after they passed the North Pole, the Canadian side took over responsibility for the airdrops. Supplies included food and batteries, and, on one occasion, replacement skis. The skiers reached the North Pole on April 26, and were welcomed by a group of journalists, officials (including energy minister Izraeli from the USSR and mining minister M. Masse from Canada), and radio amateurs involved in support and communications. All were flown in by helicopter from NP-28, the Soviet drifting ice station about 30 km from the North Pole, which contained an airstrip suitable for the Antonov AN-74, and Canadian Twin Otter and Hawker Siddeley HS748 airplanes. One airdrop, this time containing champagne and caviar, was made in front of the whole party. As the visitors were hurrying back home, the skiers started their 750 km trip to Ellesmere Island. Two more air drops were carried out, and they remained in good health and spirits. The Transpolar Skitrek Expedition came to a successful conclusion on Wednesday, June 1, 1988, at 14:35 UTC as the 13 skiers stepped ashore on Ward Hunt Island just off the coast of Cape Columbia, Ellesmere Island. message 1, March 9, after one week "on the ice"
that are not being worn as they freeze instantly when taken off. Russian skis broken and we will replace them with Canadian. longer days and warmer weather. Daily reports were made by the team to communications support stations on Sredniy Island, USSR, Russian ice station North Pole 28 and Resolute Bay, Canada via amateur radio. These reports were relayed south at 1500z in the 20m amateur radio band on 14.121mHz USB. Reports were automatically taped and reduced to daily information notes for continuing logs. The 1988 Polar Bridge Expedition: effects of the three-month trans-polar ski-trek on aerobic fitness and skiing economy. Booth MA, Thoden JS, Reardon FD, Jette M, Rode A., Arctic Med Res. 1991;Suppl:542–44. Article about Laurie Dexter member of the joint Soviet-Canadian Polar Bridge expedition that skied from Russia to Canada through the North Pole in 1988. Stresses encountered in the trans-polar ski-trek Arctic Med Res. 1991;Suppl:478–80. This page was last edited on 14 January 2019, at 01:08 (UTC).